Kristen Marks, ultrarunner, attorney, author, speaker, proud wife and mom, is the founder of My Pink Lawyer®. She has been helping Florida women and families protect their assets from unnecessary government interference, exorbitant legal fees, lengthy time delays, and family fights for over twenty years. My mom and I were in the middle of a self-guided scavenger hunt in Balboa Park in San Diego a couple weeks ago. It’s been a five year tradition now for us to take an annual “girls” trip to explore a new city. We have visited Palm Beach, New Orleans, Chicago, Washington D.C., and now San Diego together. Oh, but the adventure continues! Having already explored the many beach towns north of San Diego and taken a trolley tour around San Diego to visit many of its neighborhoods (Coronado Island, Little Italy, Old Town, the Gaslamp District), I was racking my brain on something fun we could do on our last day. I knew that renting bikes or scooters were out of the question since my mom has no sense of balance. Seriously, she will stop her bike and pull over if any pedestrians are approaching! 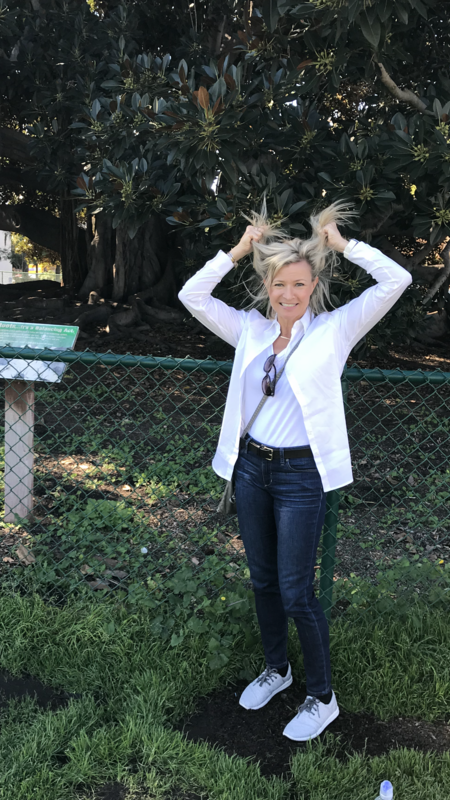 A scavenger hunt through Balboa Park sounded like a perfect way to get some exercise and explore a new part of the city and most importantly, ON FOOT. In reality, it took these bozos almost four hours to complete a “2.5 hour” scavenger hunt. Following instructions from the website on my phone, the instructions told us to “head north through the playground” to find a sundial and answer a question about what type of sundial it was. We split up and searched and searched and searched. At one point we even broke out the darn compass on our phones to make sure we were truly headed north. We must have walked past that darn thing five times and certainly walked about an extra mile trying to find it. I mean, seriously. How hard can it be to locate a compass in the middle of a children’s playground? Pretty difficult for these two ladies obviously. I’d like to say that our navigating skills improved dramatically after the sundial question but every stop thereafter on our 15 question hunt pretty much resembled the sundial debacle. I was ready to pull my hair out at one point and throw in the towel. But, like mother like daughter, we’re both stubborn and we were committed to seeing the scavenger hunt through to the bitter, ugly end. Four hours later, soaked in our own sweat, we finally hauled our tired bodies back to our rental car. Thank goodness that was over! Of course our pitiful results are posted somewhere on an online leader board in the cloud but I’ve been too embarrassed to look at it. I’m sure we were the slowest team in Balboa Park history to finish the scavenger hunt. It may not always be pretty but there is something to be said about following through on a commitment (even if self-imposed!). And you may not know how something will end, but you just keep putting one (tired, feeble) foot in front of the other and eventually your plan will work out. So too with the estate plan you implement for your loved ones. You may not know how to begin or what your family succession plan will ultimately look like, but you get started anyway and keep putting one foot in front of the other. And, with the guidance of a qualified, trusted estate planning professional such as My Pink Lawyer®, you won’t craft your family succession plan alone. There were times when I wish my mom and I had a guide with us in Balboa Park that day. The scavenger hunt was fun overall but certainly not very efficient! Admit it. Are You a Helicopter Parent? Ready for Some Tough Love? !